Great news. Whether you’re a working pro or magic hobbyist, and you missed Andi Gladwin’s October 8, 2016 “At the Table Lecture”, don’t wait, it's available to download an archived performance right now. Your bank account depends on it! What makes this lecture so outstanding, and ‘valuable’, is it’s not another lecture that slams together trick after trick after trick. I know a lot of people love these lectures for the opportunity to learn new tricks, but if you’re like me who subscribes to the lectures and you’ve already been loaded up with tricks – Andi offers something that I can only say is a major value add – He teaches magicians and hobbyist how to actually make money doing what they love – and that’s performing magic. Anyone who is familiar with Vanishing Inc. and has ever purchased something from the site knows that the company is run by two of the most talented, smartest and nicest artists/inventors in the field today. 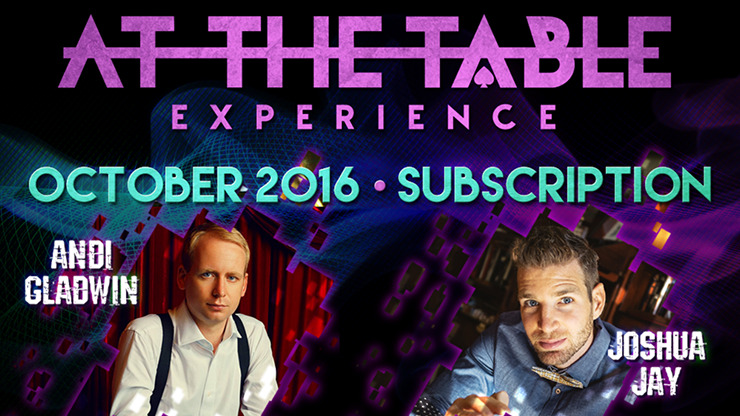 I was particularly looking forward to October’s “At the Table” line up because this month features Vanishing’s duo, Andi Gladwin and Joshua Jay, who performed memorable lectures in the past. Andi’s new lecture is chock full of up to date marketing and business advice that quite frankly would cost you hundreds of dollars to attain if you hired a business consultant to teach you what he covers. What’s also fun is his business partner and best friend, Joshua Jay, is the host of the lecture. As well as an entertaining magical technician in his own right, Andi proves to be a credible and smart businessman in this latest outing. As the result of his being an accomplished web designer and IT professional before going into magic full-time, he shares with the viewer expert tips on how to design the best magic website, the reasoning behind why ‘less is more’, how to use Facebook to promote your shows, and why magicians should include ‘audience reaction’ pictures on their site – 10 to every one ‘posed’ picture. He also talks about the importance of adding a sense of ‘urgency’ to your messaging on your website and using phrases that motivate potential bookers to inquire about your services and hire you much more quickly. He also talks about how to specialize in becoming a successful wedding magician and the do’s and don’ts in working that venue. There’s enough on that subject to more than justify the cost of the lecture alone. And of course he performs and teaches some fantastic card routines. He tips his Fireworks walk-around routine – an entertaining series of card effects that bombards the senses with 12 magical moments in less than three minutes. He also teaches a very unique three card Monte trick and another card stunner called the Pocket Mule, based loosely on Roy Walton’s Smiling Mule trick. All of the tricks are fairly easy to master with a little practice. He finishes off the lecture with what he calls some quick fire tips and wraps things up with some advice on how to transition from your day job to becoming a full-time professional magician. This was one of my favorite lectures to date due to the mixture of real world intelligent business advice, along with enough card tricks to fill any set you would find yourself needing to perform at a cocktail party, wedding or restaurant engagement. I can’t recommend this lecture enough. Check it out and become a more prosperous magician today. The reviewer above me said it best. I really have nothing to add other than this lecture series has greatly improved my business. I highly recommend it if you are serious about going pro. Critically-important advice on the business side of magic from Andi, and practical effects from both guys for a variety of skill levels. The most fun is watching the two best friends tease each other throughout the lectures. They really enjoy what they do, and enjoy sharing it with the rest of us. Highly recommended.